Instant Pot Chocolate Lava Cake is rich, gooey and done in 30 minutes! Perfect quick fix for when those chocolate cravings hit. 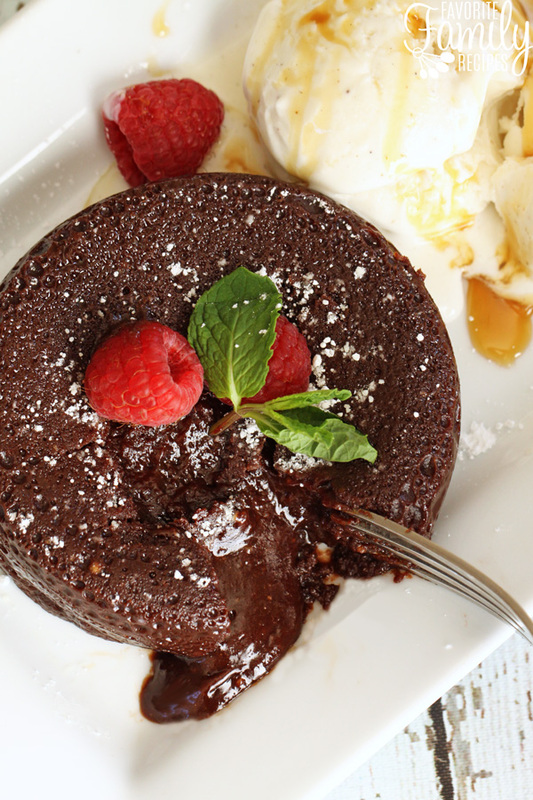 Instant Pot Chocolate Lava Cake comes together in just a few minutes, and made with simple ingredients. This is the best dessert to whip up when it’s late, you’re wandering around the house craving something sweet and a handful of chocolate chips from the pantry just isn’t going to cut it. It just as easily can be a centerpiece dessert after a special Valentine’s Day dinner. Super versatile, gooey, and so yummy, this is one of my favorite indulgent treats! Dessert in the Instant Pot or a pressure cooker can be tricky. Trust me, this recipe came about after three failed attempts. With Instant Pot desserts you need to be fairly exact with your cooking times. You also need to consider that cooking times will be different at different elevations. When cooking dessert or anything in the Instant Pot, you need to make sure you have enough liquid. To make this easier, I like to place the steam rack in the instant pot first. Then, I like to add a couple cups of water to the bottom. Lastly, I place the dessert containers on the steam rack. This places the dessert cups up out of the water and makes them easier to remove from the Instant Pot when they are finished. Since this recipe makes 4 dessert cups, you will have to place 3 cups on the bottom and one cup over the top (as seen in the picture below). Don’t worry, they will all still cook perfectly, even if they are stacked! I cooked these Chocolate Lava Cakes for 8 minutes and did a quick release. I live at a fairly low altitude so this time was perfect for me. If you are at a higher elevation, you may want to add a minute to the cook time or allow to slow-release for a minute or two. Just don’t let it slow release for too long or it will over cook and the middle won’t be nice and gooey. You will also want to serve these within just a few minutes of being removed from the Instant Pot to get that perfect center. For this recipe I like to use dark chocolate because I think it makes it extra rich. You are adding sugar to the batter so it will still be plenty sweet. If you simply won’t use dark chocolate or if you don’t have it, you can also use semi-sweet. If you aren’t a fan of having fruit with chocolate, instead of adding raspberries, you can drizzle a little salted caramel or whipped cream to the top. This recipe uses VERY little flour. Only a quarter cup! That is great news for those who are wanting to make a gluten-free version. Just swap out the flour for your favorite GF flour and you are good to go! If you have a good GF flour, you won’t even be able to tell the difference because the flour amount is so small. Namaste flour from Costco works great or if you have a homemade flour blend that you like, that will work great too! Place chocolate chips and butter in a microwave-safe bowl. Microwave for 30 seconds, remove from microwave and stir. Place back in the microwave for another 30 seconds and stir until smooth. In a separate bowl, whisk eggs, sugar, flour, and vanilla together until smooth. Pour chocolate mixture into egg mixture and stir well to combine. Spray four 6-7-ounce ramekins with cooking spray. Fill each ramekin 2/3 of the way full with batter. Put steam rack in the bottom of the Instant Pot and add 2 cups of water. Place ramekins on the steam rack, placing 3 of the ramekins directly on the rack and one over the top and in the center of the 3 ramekins (as seen in photo above). Place lid on Instant Pot and place tab to "sealing". Manually set the time to 8 minutes on "high" pressure. 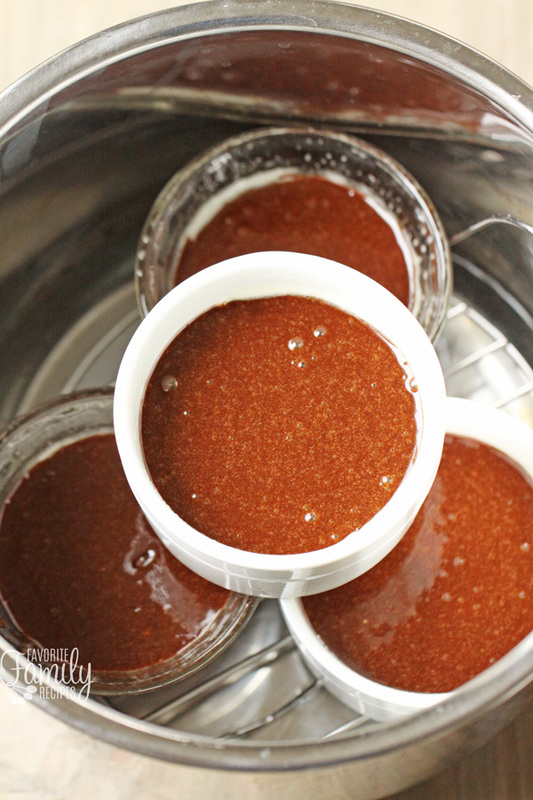 Quick release the pressure and carefully remove ramekins from Instant Pot. Serve with ice cream and add mint leaves and raspberries for garnish. We loved it! Will be making again soon. Oh so glad you liked it!!! Happy Valentine’s Day! Did you use self rising or all purpose flour? We don’t have calories available yet for our recipes. Hopefully soon! 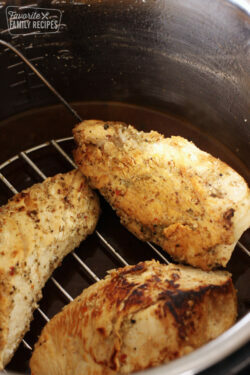 If you plug this recipe into a calorie calculator online you should be able to find calories. Hope this helps! Tom—it’s a short ingredient list—add them together. Google each item, like, “calories in 3 eggs” and it will pop right up for you easily. On another site with a very similar recipe there was about 450 calories per lava cake. Can i use silicon muffin cups to make this? I’ve been dying to try these but don’t know if there’s changes to be made if they are done in 4 oz mason jars. We haven’t made them in mason jars before but since the size is smaller than what is in the recipe, I would definitely reduce the time by at least a minute or two. You may have to experiment with it a little. 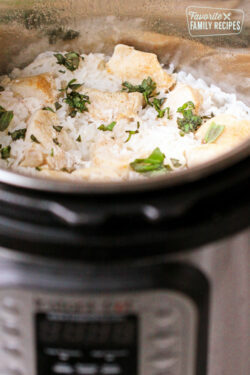 The nice thing about the Instant Pot is that you can re-try without losing much time! I followed exactly and weren’t cooked after 8 mins. Just slightly above sea level so that shouldn’t matter. Strange. After 8 mins on high I found it to be mostly gooey all the way around. Any ideas? That is strange.. 8 minutes was perfect for us. If it turns out too gooey next time, maybe just bring to pressure once again for a minute or two and then quick release. Hopefully the extra time will make it cook through better. Hope this helps! This desert was delicious! Ours was more of a “pudding” than cake, which is basically what’s shown in the photo, but it was so good. We did eat it right away, and it might have set up a little more on the outside if we had waited, but no necessary. So simple and wonderful. I used semi-sweet chips because my husband is not a dark fan. Can you make batter ahead of time (say 1 day) and put it in the fridge? Or will the chocolate harden? I don’t know if the chocolate will harden, but it might throw off the consistency. We haven’t done it that way before so I don’t know for sure. IF you try it, let us know how it turns out! I am making the batter right now a few hours before and prepping the ramekins. I hope it works! Hi Juli- How did it turn out? If I cut the recipe in half and make two cakes, do you know for how long I should put them in the instant pot? The time should be close to the same if you are just cutting the recipe in half. If you do reduce the time, I wouldn’t do it for more than a minute. Hope this helps! I’d just make the entire recipe and freeze the rest! When you eventually thaw the ones that are frozen, they won’t be as gooey- but still delicious! I have Hershey’s Special Dark Cocoa (100% cacao). Do you have any ideas on how I can use the cocoa to substitute for the 1 cup of dark chocolate chips? I used this dark cocoa to substitute for bittersweet and semisweet chocolate in a molten lava cake recipe years ago, and it turned out really dark in both taste and color! We haven’t tried it that way before so I can’t tell you for sure what I would do. They are different consistencies so it makes it hard. You would have to add some sugar and probably some extra butter to get the creamy texture but I can’t tell you the exact amounts unless I try it. If you give it a try, let us know how it turns out! I just made this for my birthday cake in my new instant pot. I put all the batter in a bigger glass dish because I don’t have ramekins and cooked for 13 minutes on the rack with 2 cups of water as directed, and it was divine with a scoop of vanilla ice cream!! Yum! I will save this and make it again and again. So glad you liked this recipe, and happy birthday to you!!! Good to know that you can also make it in a bigger glass dish– we haven’t tried it that way before so I’m sure our readers will appreciate this comment! Thanks Heather! Hi heather! What size dish did you use? Ok great! I want to use one big dish too! can you substitute cocoa powder for flour? Are you asking if you can use cocoa powder instead of flour? I am not sure if it would rise the same if you made that substitution. It isn’t a substitution I would recommend but if you try it let us know how it turns out! Wow! Thank you for taking the time to come back and comment 😀 So glad this lava cake was a hit for you! I have to be honest; mine was absolutely disgusting- soggy, eggy just horrible. Followed recipe step by step and it came out disgusting. not wasting money on this again. sorry. I am so sorry this didn’t work out for you! I don’t know why it turned out that way for you– have you tried our Carnival Melting Cake recipe? That one is done in the oven and might work better for you? My husband is making this for my birthday dessert tonight! Sounds delicious! Can’t wait! There are 5 of us.. Have you ever put less than 2/3 cup in each ramekin to stretch it to 5? Or doubled the recipe to make 8? You can reduce the amount in the cups, just make sure you reduce the cook time as well. You can definitely add more ramekins and stack as many in there that will fit- if you add more you don’t need to change the pressure time. Hope this helps! Agreed! Thank you for the 5-star rating! I followed exact steps and it didn’t come out good. There is no lava in my cake. Cake was fully cooked from inside. I used semisweet chocolate chips with 63% cocoa in them. I also didn’t have that spongy texture at all. Don’t we need to add baking powder or soda in the recipe. I have a 8 qt instant pot. What might i have done wrong? Please suggest. It must have been the baking times. We haven’t experimented with cooking times at different elevations. That could have had something to do with it? What elevation are you at? I just got the installer for Christmas. 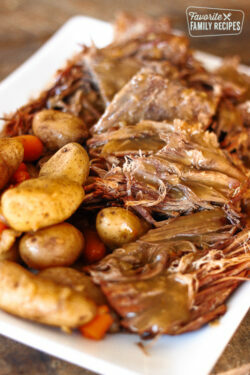 I am trying this recipe for the first thing I make in the instapot. Do I use the cake setting or pressure cooker setting? You should use the manual setting for this recipe. Hope this helps! I followed the recipe exactly using gluten free flour. The edges were cooked but the centre was more liquidy. Could it be the gluten free flour? I’m tempted to add a bit more flour in the mix, because I increased the time for the second batch and it didn’t make any difference. Taste was amazing and my daughter wanted that for her birthday instead of cake with fresh whipped cream. What kind of GF flour are you using? That is most likely the issue. Just a thought… maybe try avoiding the microwave! The “micro-waves” are radiation. And just like a cancer treating Chemotherapy radiates cells to kill them, so do the waves of the beloved home appliance …radiation damages the molecular structure of your foods… leaving you with close to zero nutrion 😉 and a home-made cancer causing dish! This is just not true, Erika. Radiation is the act of releasing energy, and it works on a spectrum from high to low. The radiation used in chemotherapy is a high spectrum energy, that has the ability to change molecular structure. The microwave oven uses a low spectrum energy that is only powerful enough to vibrate the water molecules in our food, to produce heat. The oven cooks food, but is not powerful enough to change the chemical or molecular structure of it. And, if anything, microwaves are useful for fresh food retaining its nutrients. Get to know the microwave better, and might I suggest not trying to actively frighten people unless absolutely necessary? Thanks for correcting her misconception. Science is not to be feared but to be understood and used!!! Incredible! I halved the recipe and decided to try just 1 egg…perfection! 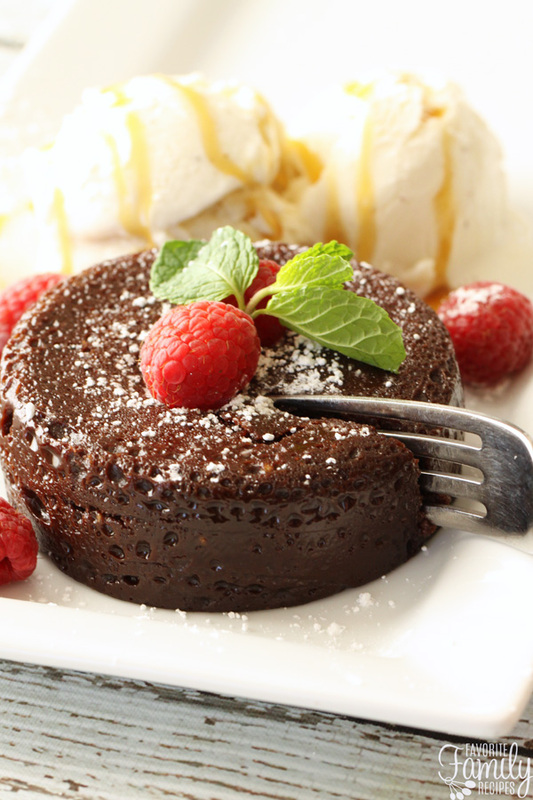 2 perfect little chocolate lava cakes! Kept the same cook time. Perfectly cooked and tasty! Loved that I had all these ingredients on hand! Couldn’t have been easier to whip together and a lot cheaper than going out to order a lava cake. So glad you liked it! Haven’t tried it with blackberries before but that sounds delicious! Not a fan of dark chocolate . . . can this be made with milk chocolate? Yes, it will just be more sweet 🙂 Hope this helps! Do you know how much to reduce the sugar amount with milk chocolate? I would reduce it by 1/4 c. if it were me but I haven’t tried it so I can’t say for sure. Hope this helps! Thank you so much Julia! I am so glad this recipe has worked out for you. Thanks for the 5-stars! If using one large dish, which size? Does cook time need adjusting? Yes, it you are using one big dish you will need to cook it longer. We haven’t tried it all in one dish before so I don’t know the best way to advise. I would probably start by adding another 2-3 minutes and then go from there. Hope this helps! This cake taste really good. It came out more like pudding in the inside. I was hoping for a flow of chocolate. I will try and cook a minute or two less next time. How big are the ramekins? Mini are 1. 5 x 3. Is that too small. The ramekins are 8 oz. Hope this helps! This is my “go to” dessert. 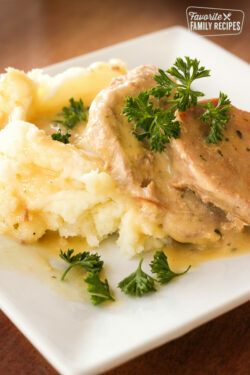 It is quick, easy and delicious. Always have the ingredients on hand. 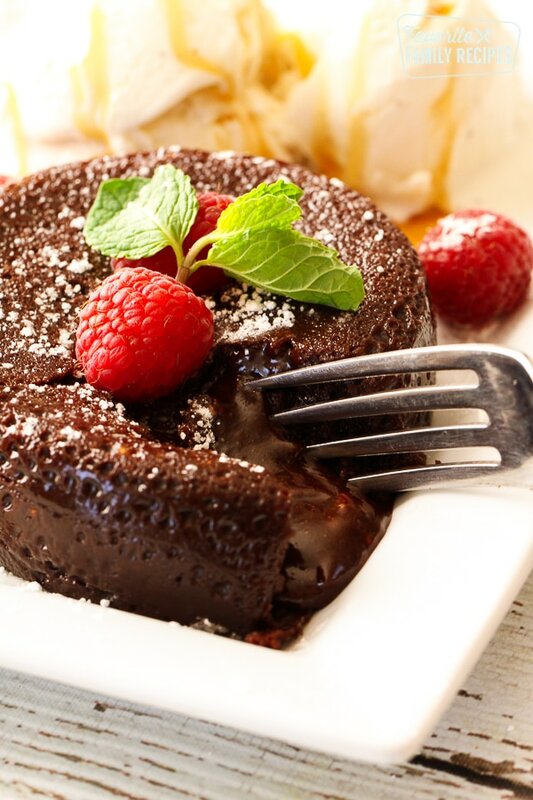 Everyone loves these lava cakes and requests them when they visit. I even make the day before and stick in fridge (covered). Take out and put in microwave for about 30 seconds, just long enough to loosen from ramekin, then turn onto plates and serve with whipped cream. Yummy!